I am writing to you with regard to the urgent case of Mohammad Mehdi Maleki, an Iranian asylum-seeker who has sought refuge in Sweden from persecution by the Islamic Republic of Iran (case no. 10983677). Mr. Maleki is a student human rights activist who has engaged in political struggle against the Islamic Republic; he has been imprisoned three times for these activities by the Islamic Republic, and he has been sentenced and lashed 99 times for demanding human rights in Iran. Mr. Maleki is also a baptized convert to Christianity; this is called “apostasy” in Iran and is punishable by death under Shari’a law. Yet the government of Sweden has inexplicably denied Mehdi Maleki’s application for asylum and is illegally implementing his deportation on May 12, 2011 – an act that will result in his execution in Iran. 1- Mr. Maleki meets all criteria for formal recognition as a refugee; it is thus illegal to refoule him. Article 33 (1) of the 1951 Convention relating to the Status of Refugees, which states that: “No Contracting State shall expel or return (‘refouler’) a refugee in any manner whatsoever to the frontiers of territories where his life or freedom would be threatened on account of his race, religion, nationality, membership of a particular social group or political opinion.” Sweden, as a signatory to the UN Convention and Protocol Relating to the Status of Refugees, is required under this convention, and consequently under jus cogens international law, to comply with the inalienable rights of refugees to asylum, protection and no forced return to their country of origin. – Mohsen Beikvand, who was executed by method of torture in Ward 6 of Hall 16 in Rajaei Shahr prison on August 31st, 2010, was a young protester like Mehdi Maleki. 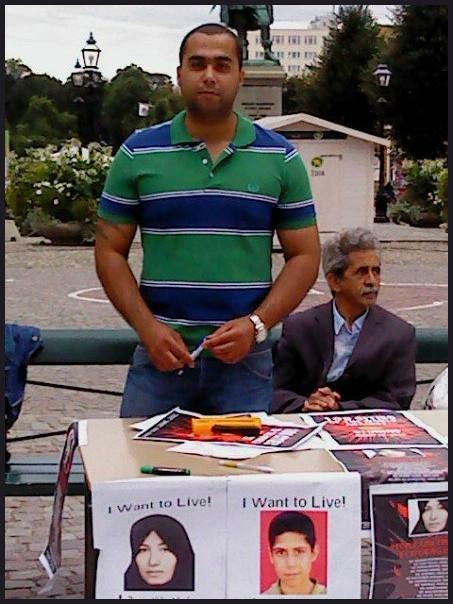 He, like Mehdi Maleki, worked to expose the crimes of the Islamic Republic; video of his tortured body and his personal testimony of the torture he sustained in prison as a result of protesting is publicly available (http://persian2english.com/?p=11248). Mohsen Beikvand was executed shortly after his video-recorded testimony was made public. – Christian priests Yousef Nadarkhani and Behrouz Sadegh-Khanjani are currently under execution sentence in Iran for apostasy. There is also ample photographic evidence and witness statements regarding the tortures and beatings of Christians in Iran, as implemented by the Islamic Republic’s Intelligence Ministry, for example: http://hradns.info/1389-01-27-05-24-07/5942-1.html. There is no question that Mr. Maleki will be executed if deported to Iran. Thus, deporting Mr. Maleki to Iran is tantamount to an execution sentence being implemented by the government of Sweden. Execution is illegal under Swedish law. 3- The Islamic Republic considers all Iranian political asylum-seekers to be criminals, deeming their quest for asylum as propagating against the regime. The Islamic Republic has on several occasions declared and applied its intent to prosecute returned political asylum-seekers, on the basis of Article 7 of the Islamic Republic’s Penal Code. The regime’s Chief Prosecutor, Mohsen Eje’i, has supported arguments articulated by retired judge and lawyer Abdoulnabi Molahzadeh, who stated on February 17, 2011 that anyone who has filed a political refugee case is considered a person engaged in propaganda against the Islamic regime and therefore criminal and subject to prosecution under Article 7. One recent example of the application of this intent is the case of Rahim Rostami, a teen-aged Kurdish asylum seeker who was extradited from Norway to Iran on February 9th 2011, and is currently detained in Evin Prison (which houses primarily political prisoners). Yet despite this finding, the Swedish government continues to deport Iranian activists like Mohammad Mehdi Maleki, and others, who are clearly and undeniably at risk not only of detention and torture by the Islamic Republic of Iran, but at unquestionable risk of execution. We demand an urgent, immediate halt to Sweden’s intended illegal refoulement of Mohammad Mehdi Maleki, who is at clear risk for execution if returned to the Islamic Republic. Given the the Migration Office’s blatant, repeated violations of refugee rights that risk the lives of Iranian and other asylum-seekers, we demand that Sweden must not only immediately halt the illegal deportation of Mohammad Mehdi Maleki, but must immediately cease all deportations to Iran. Hoppas att han få stanna..